A Fete-Champetre by Antoine Watteau, Part 3 of the Introduction to Art and Artists of Our Time. From the picture by Antoine Watteau. After Watteau's death his reputation declined, and in the time of Napoleon his works could neither be sold nor given away. Of late years, however, his fame has revived, and every picture from his hand that can be found, is disputed by the amateurs to the point of folly. It is a pity that Watteau's pictures are seldom in good condition; he was a careless and hasty painter, and his canvases have deteriorated with time. Enough remains, however, to justify his contemporary reputation, and the modern revival of his fame. He left behind him a large number of studies in black and red chalk, which are perhaps as indicative of his talent as his painting, and they are as highly prized. "L'Accord Parfait," the picture which we reproduce, belongs to the category of his "Fetes Galantes" as they were called; people of the rich world playing at pastoral life. We see them assembled in the parks of chateaux and palaces, sitting in groups upon the lawns, playing upon the lute, chatting, and laughing; or gathered, as here, at the foot of some mistletoe-covered tree, in whose shade an antique statue of Pan or Priapus hides, and listens to the harmony of flute and flute-like voice, whose "perfect accord" is reflected in the two lovers listening, as they stroll down the avenue, at once to the music and to their own idling talk. We never suspect Watteau of any concealed thought in his pictures, else we might ask ourselves whether he meant anything in particular by putting this young man in the forground reclining with his back to us, and holding in his hand his silent lute. Whether Watteau meant it or not, and probably he did not mean it, we can but think the harmony would be more perfect were this youth to take the place of the much-bewigged courtier who is playing the flute to the fair young lady's singing. And in spite of the frivolous character of Watteau's subjects, his own personality, amiable, sympathetic, inclined by ill-health and by the struggle with life to melancholy, may perhaps have betrayed itself occasionally in some touch of sentiment like this. 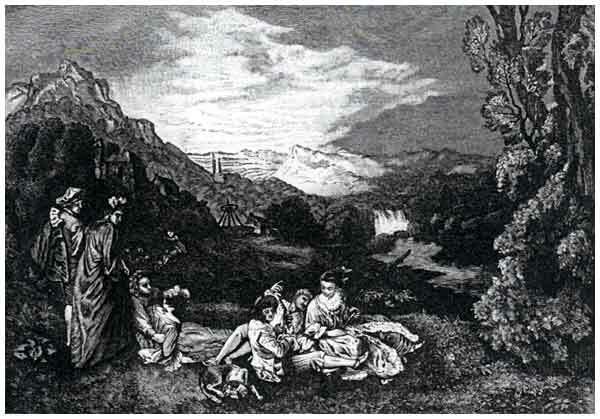 Occasionally, too, we detect a vein of gentle unconscious moralizing, as where, in a picture in the Berlin gallery, "Country Pleasures," a party of gallants are idling in the foreground of a rich landscape, singing, playing the lute, walking in couples, or snatching unwilling kisses, sitting on the grass, while in the distance the shepherd keeps his sheep and the cottage with its great threshing-machine, telling of a world that toils and spins, nestles at the foot of the hill crowned by the chateau whence has issued this gay company who neither toil nor spin. Next comes a group of artists, a little later in time than Watteau, but always thought of in connection with him, although in truth, both by the beauty of his painting and something suggested greater than his subject, Watteau holds a place apart, and as he is better known must be more and more distinguished from them. These were Boucher, Greuze and Fragonard, to name them in their order of birth. They have this merit, that in their clever, sometimes charming, but always frivolous pictures, they perfectly represented the time in which they lived. They made no attempt to rise above that time, and since their own lives were as truly reflected in their works as was the society from which they drew their subjects, we are not surprised that they should have had their revival, too, since now-a-days we are coming to prize every work of art, no matter to what age it may belong, that truly reflects that age, or any of its phases.